will be our Annual Spring Fest Extravaganza! Wake up and Bloom for Spring. This year’s abundant festivities include ‘The Great Ecological Race’- wheelbarrow race between Middle years kids and their parents, MC’d by the Fabulous and Fantastic Will Tait. Welcome to Country with Aunty Kim Wandin- (Wandoon), local Wurundjeri Elder. Multicultural performances from Chin Community Dancers, Aztec Dance, Sarita McHarg- World Reknown Sitar Player and Singer, Zaar Belly Dance, Tomi Muramatsu, Gustavo’s Drummers, Tuvaluan Dancers, MOOP Officers: Will Tait and Brendan Jones, Black Bug City, Stage MC’d by the charismatic and talented Simon Oats. 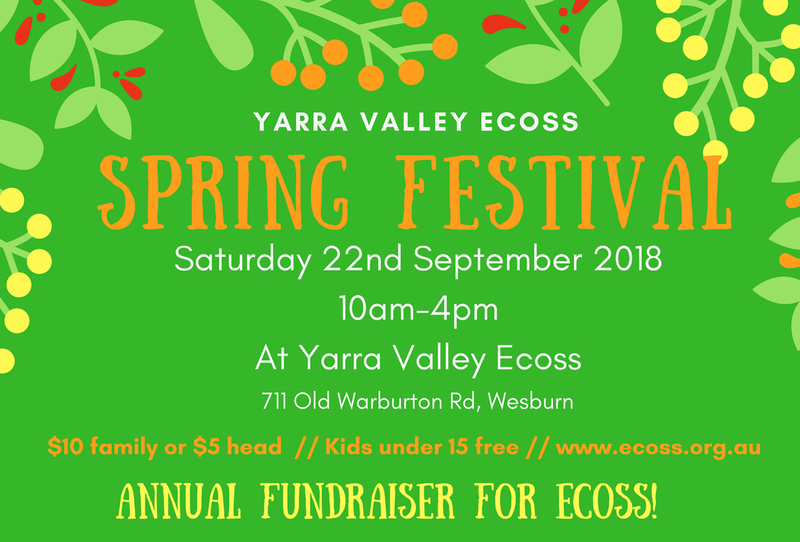 Tiny House talks and tours, Bio-dynamic Farm tour, Migrant Information Centre, Marine Mammal Association, Yarra Valley Bee Group Talks, Permaculture Yarra Valley ECOSS projects tour, and GRAND OPENING OF RELAB- (rehab for old items- up cycling and boutique craft centre!). Eco – Market with delicious local, healthy food and drinks! 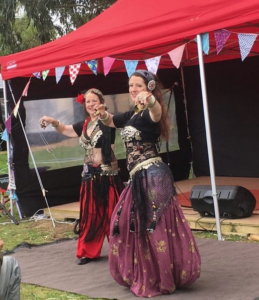 Meet- Yarra Valley Bee Group, Kids Clay play in the Community Pottery Studio, LGBTQI+ rainbow flag painting, apple peeling, kids meditation and sound healing and loads more activities underway. 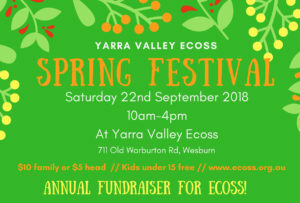 The Spring Fest is ECOSS’s largest fundraising event in the year. This is how we keep ECOSS’s activites low cost and accessible for the whole community. 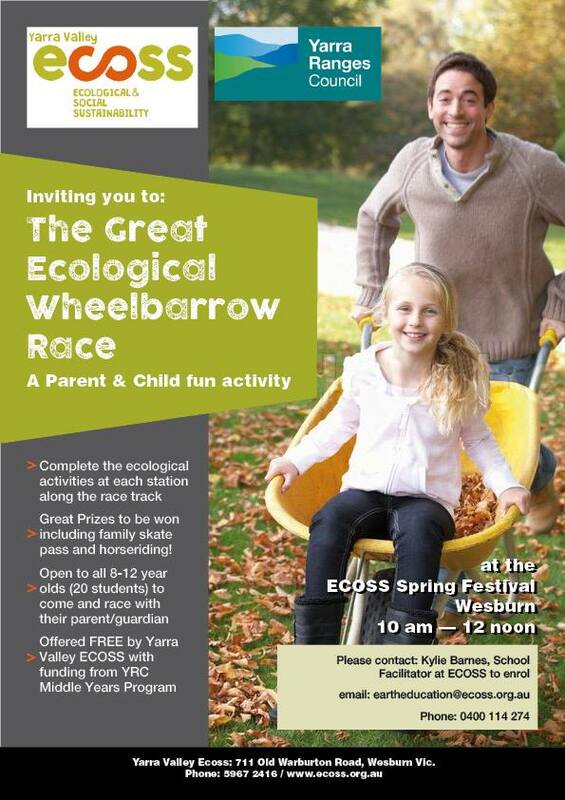 ECOSS supports many Not for Profit groups through out the year, and here is your chance to support ECOSS. Please come along with generous limbs and help to make this the most successful fundraising event it can be! Aunty Kim Wandin (Wandoon), Wurundjeri Elder, will Welcome us to this Country. 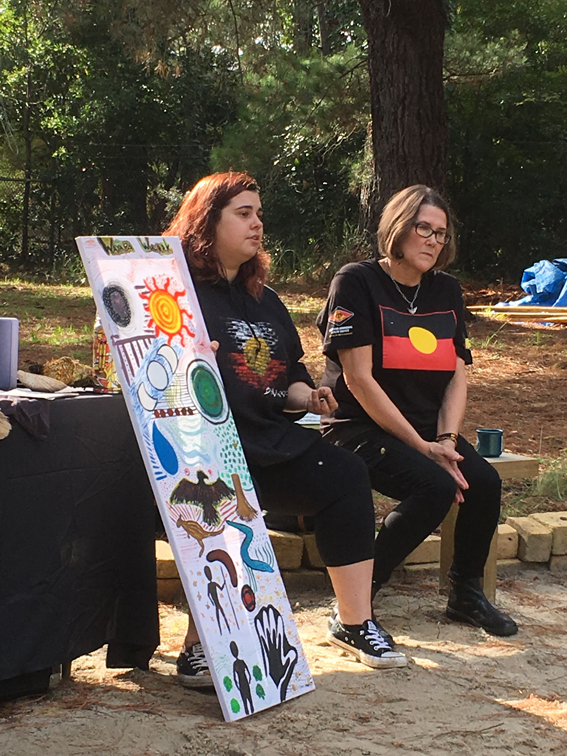 We are incredibly grateful to have Aunty Kim- and Michelle Atwell pictured as supporters of what we do here at ECOSS. Come and pay respects to the elders, the people, and the land we walk upon. 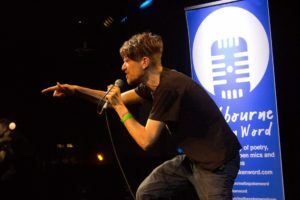 Will Tait is a songsmith, MC and presenter with a passion for inspiring wonder and revealing the hidden potential in situations and gatherings. He is motivated by the idea that our modern global culture is reaching out for a new story about the workings of the world, a story in which we see ourselves as integrally connected to each other and our universe. Through music, theatre, whole-heartedness and humour he aims to create moments of sharing, inspiration and joy that help make this new story tangible and trustworthy. 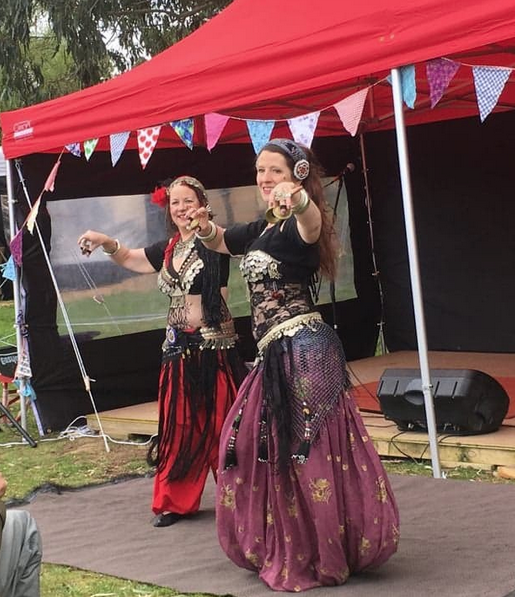 Zaar Bellydance is a tribal style belly dance troupe from the Yarra Valley. They have a reputation for hypnotic and joyous performances that express the strength and timeless quality of the feminine. Have you ever seen a flaming trumpetist? What about a rolling club jugglist? 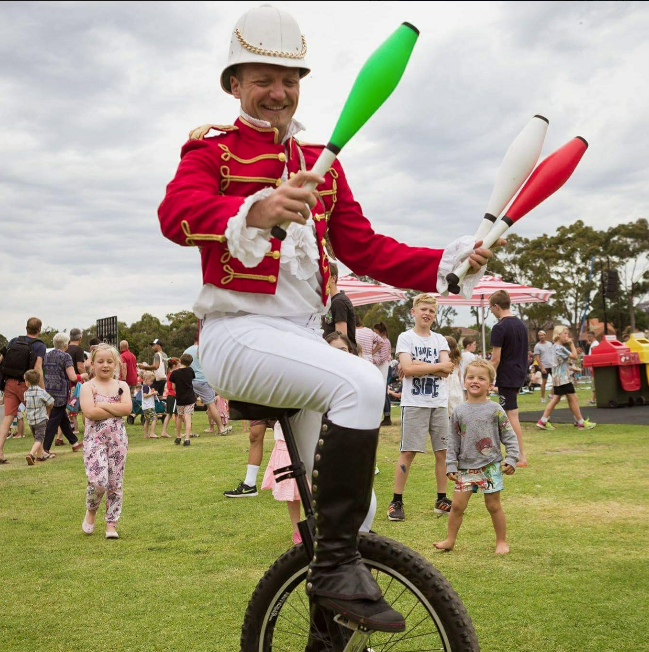 Flaming trumpets and one wheel club juggling you ask? That’s an impossible task! Or is it? Presenting Blunderbuss Jones. Musician, artist, performer. He club throws, rolls and trumpet fire blows. With a fun and original, bouncy soundtrack for stage or roving. Lighting up spaces with a-blazing horn, keeping you all deliciously warm! 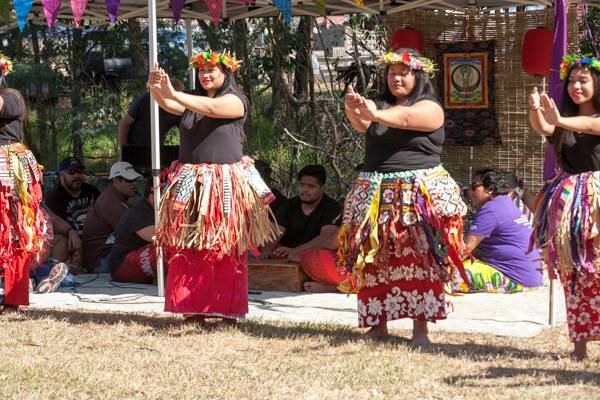 These beautiful Tuvaluan Dancers represent our local Tuvaluan Community. 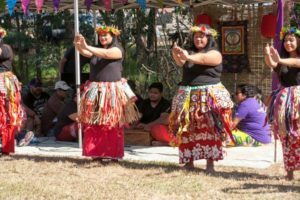 Keeping Culture alive, they also educate the community about the devastating effects global warming is having on their tiny island with rising sea levels. Simon Oats is an acclaimed storyteller, singer, songwriter, actor and playwright. Orpheus in the Underworld is the epic tale of one man’s quest to take back his lover from the Gods of death – told through eleven songs and the voices of 6 different characters. 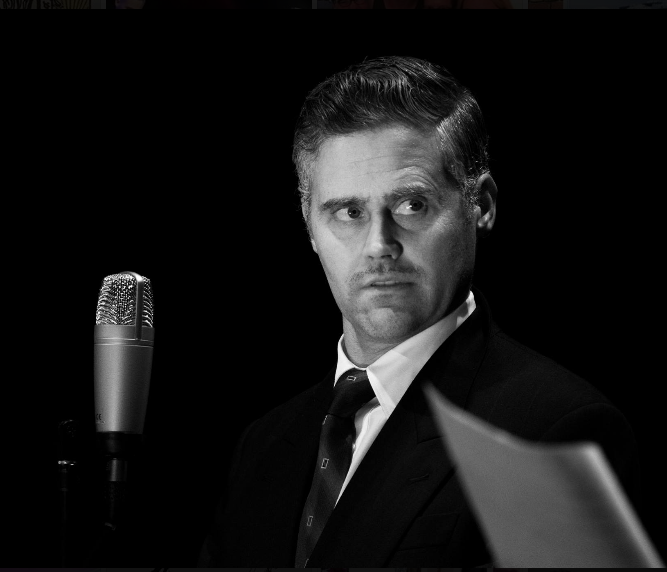 Simon has performed Orpheus in Arts centres, private homes and even for a hen’s night. His fans include a Pulitzer Prize winner and a Hells Angel. The Chin are a Sino-Tibetan race, descended from central China. Within Burma, they predominantly inhabit Chin State, which is located in the north-west of the country, bordering Bangladesh (to the west) and India (to the north). It is estimated that approximately 500,000 Chin live within Chin State, with an additional one million living inside Bangladesh and India1. The total area within which these 1.5 million Chin are concentrated, extending 36,000 km2 along the Indo-Burman border, is known as Chinland. 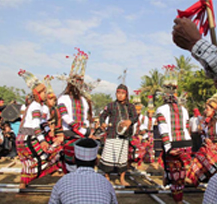 The Chin are composed of many individual tribes, including the Asho tribe, Cho Tribe, Khumi Tribe, Kuki Tribe, Laimi Tribe, Lushai Tribe and Zomi Tribe. It is the only state in Burma where the majority of the inhabitants are Christian. Meet Arvo, musical prodigy. 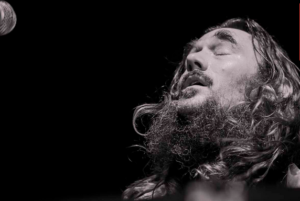 Arvo can play just about any instrument he picks up- and well! 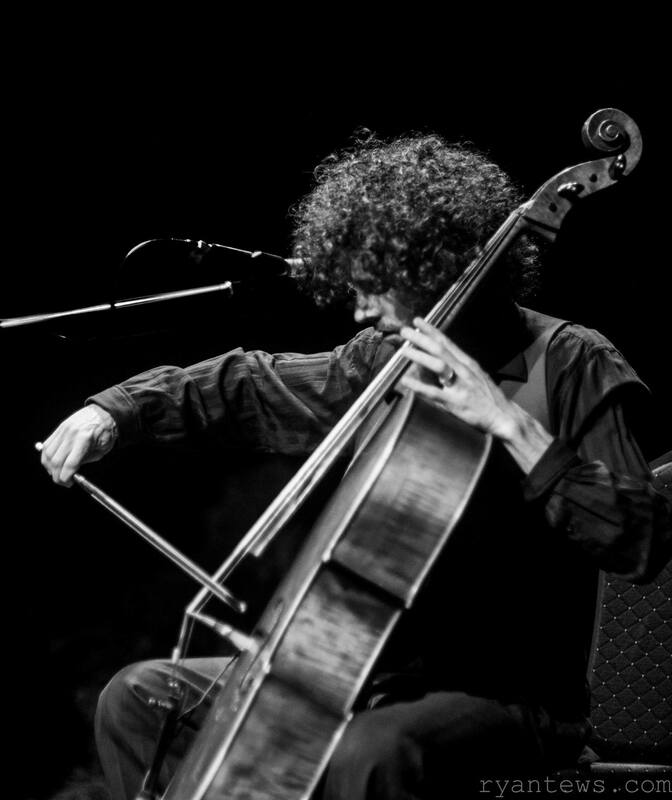 Arvo will be showing off his Looping Cello skills on stage at the Spring Fest. Arvo is a music teacher at Little Yarra Steiner School and will be running classes at ECOSS. Hunch explores boundaries through spoken word with rambunctionus rantings of insight, self loathing and self acceptance. Known for his signature syncopated style and twisted lyrics, he searches for humour and meaning in the dark recesses of the human condition. He’s obsessed with electronic music because he’s actually a robot, but he’s trying hard to be human. Dance, Fitness, Fun & Funky Music!! Love to dance but scared to go to a class? Nia could be for you! Designed to get your brain and your body working together, Nia is a fantastic way of getting fit to fabulous music while having fun. It’s a judgment free zone and everyone is encouraged to move in the way that feels best for them. Here’s a copy of the incredible line up for the day!